"Tonight is the pinnacle, tonight is the Nashville dream," Blake Shelton told a room filled with journalists backstage at the Grand Ole Opry Saturday night, October 23, the night his dream came true. After a decade of being one of country's most consistent hitmakers, the Oklahoma native became the newest member of the Grand Ole Opry. Although Blake is known to make jokes about just about everything, he took the evening of his Opry induction very seriously, even to the point of dressing up for the occasion. When asked who chose the black shirt and pants with gray vest and tie, he replied that his manager, Narvel Blackstock, picked it out for him. Blake made sure his parents, sister and close friends Larry and Carole Large all came in from his home state. "After Trace Adkins invited me to join the Opry via Twitter on September 28, I went out in the parking lot and called my parents and said, 'I'm sending a bus for you, because it's that important to me that you be here.'" Miranda Lambert, Blake's fiancé, couldn't be on hand for the special night, because she was performing in Nebraska. When asked if his induction made her want to become a member, Blake replied, "When she first started coming out here to perform, she didn't think this was her crowd because she is used to having a rowdy audience. This Opry audience is here to listen to the music. The last time she was here, I could see that she was beginning to understand what performing on this stage is all about. But right now, I think she just wants to help celebrate what she knows is a dream come true for me." "This is a special night and I'm proud to be a part of it," Trace said after they finished the tune. He introduced Pete Fisher, general manager of the Grand Ole Opry, who presented Blake with a 14-inch bronze replica of the Grand Ole Opry microphone, mounted on an oak base of wood taken from the Ryman Auditorium when it was remodeled. 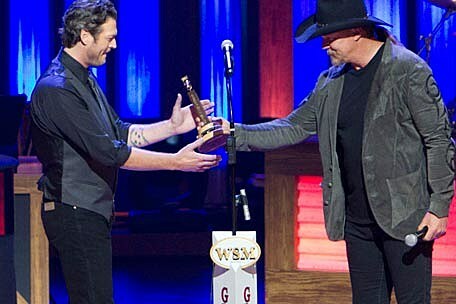 "Opry membership is unlike anything else you will ever have," Fisher told Blake as he handed him the plaque. "We applaud all you have accomplished and recognize all you have done." Trace then came forward and officially welcomed his friend as an Opry member, saying, "I became a member in 2003, and it is the single most important thing to happen in my career. I cherish it and have great respect for what the Opry represents, and I know Blake feels the same way. It means the world to me to welcome you as the newest member of the Grand Ole Opry." Blake addressed the sold-out Opry audience, noting that he had been asked what it meant for him to be an Opry member. "I didn't have a good answer for that until I walked into this circle tonight and then I knew. It's the same feeling I get when I meet one of my heroes. To me, the Grand Ole Opry is an artist, and I'm proud to be one of its songs." Blake first performed on the Grand Ole Opry on May 5, 2001. Since that time he has made numerous appearances on the show. "It is always exciting to be on the Opry, and I was thrilled to be asked to be here when the Opry House reopened on September 28," Blake said. "Then to be asked to be the newest member on the same night was unbelievable."